“Ever-Greening of Patents” has been an expression that has been extensively used in debates related to the global pharmaceutical industry at least since the last two decades. Interestingly, this term has never been statutorily defined and hence has been applied most freely by professionals, policy makers and politicians alike. It would be appropriate to objectively examine whether patents in any jurisdiction can ever be “ever-greened”. A fitting initiation to this debate is the very concept of what a patent is from the very first principles, writes Prabuddha Ganguli. The Oxford English dictionary defines a patent as “A government authority or licence conferring a right or title for a set period, especially the sole right to exclude others from making, using, or selling an invention”. This set period statutorily is 20 years from the date of filing of the patent application. Further a patent is granted for one invention and statutorily “double-patenting” is prohibited in all jurisdictions. In some jurisdictions such as in the USA, Europe and Japan, patent term may be extended for a maximum period of 5 years under specified conditions. This type of patent term extension is intended to compensate the patent owner for the time spent in the clinical development and regulatory review of a pharmaceutical product during which the patent owner cannot commercialize the product covered by the patent. However after the extended patent term, the said patent term expires and the invention as claimed in that patent is available to the public for use without the explicit consent of the patent holder of that patent. Let’s assume a molecule has been patented in a country by Patent No.1. Let’s further assume that a derivative of the said molecule is patented by Patent No.1A and that a device to dispense the said molecule is patented by Patent 1B in the same country. It is further assumed that the patent office has granted the three patents after the due process of examination as per the Patent Law in that country. The figure illustrates that every patent expires at the end of its term [or at the end of the term extension if any]. It is obvious from the figure that the claims of Patent No.1 are not enforceable after its patent term. Similarly the claims of Patent No.1A are not enforceable after the patent term of Patent No.1A, and similar is the case of the claims of Patent No.1B. It is fallacious to conclude that the protection via the claims of Patent No.1 are so called “ever-greened” till the term of Patent No.1B as has been surprisingly concluded by several authors. A generic player would be free to use the claims of Patent No. 1 immediately after the expiry of Patent No.1. Claims of Patent No. 1A and/or Patent No.1B would not come on the way of the user to exploit the claims of Patent No. 1 under such circumstances. The only requirement of any person wishing to enter the market with a product based on claims of Patent No. 1 would be to satisfy the regulatory requirement of that specific country. The claims of Patent No. 1 do not get ever-greened. Further, a generic player would not be permitted to exploit the claims of Patent No. 1A or Patent No. 1B during their respective patent terms though nothing stops the generic player from exploiting the claims of Patent No. 1 which has expired. This is precisely the philosophy of the patenting system as it promotes an inventive ecosystem. Thus if a generic player wishes to introduce a device to dispense the molecule patented as per the claims of Patent No. 1, then he will only have to invent around the claims of Patent No. 1B which possibly claims certain inventive features of a device. The generic player will then have to invent around the claims of Patent No. 1B. “Unexpired device patents exist for 90 percent of the 49 medicine/device product combinations studied, and were the only sort of unexpired patent for 14 products. Overall, 55 percent of the 235 patents found by our study were device patents. Comparing the last-to-expire device patent to that of the last-to-expire active ingredient patent, the median additional years of patent protection afforded by device patents was 4.7 years (range: 1.3–15.2 years)”. “Boehringer, which held the original compound patent on ipratropium granted in 1970, has therefore had patent protection in one form of another on this medicine for 58 years and counting (from 1970–2028)”. A simple analysis of a few related patents selected from the table 1 in their publication would demonstrate that such a conclusion is improper and may be considered as a misrepresentation of the implications of the patent system. Subsequent formulation / combination patents do not extend the term of the patent for the original drug molecule. Subsequent device patents also do not extend the term of the patent for the original drug molecule. Therefore the medicine (drug) does not get extended protection as a result of the formulation patents and/or the device patents thereby permitting a generic producer to enter the market after the respective patent term of the drug and/or device patents. The examples in table 1 of the article by Beall et. al demonstrate how the patent system promotes innovations in the fields such as drug discovery and drug delivery systems not only by the original innovators of the drug molecules, but also by others developing formulations, combination products and devices for their use. The only requirement is that the patent claims have to be respected while designing around the specific patents. Listing of patents in the orange book does not lead in any manner to the extension of the patent term of the listed patents. The only requirement is that the generic producer filing a para 4 ANDA Application has to show that it is not infringing the claims of the orange book listed patents if it wishes to introduce the said product in the US market during the term of the listed patents. Thus the ANDA applicant may ‘‘carve out’’ of its proposed labeling any patented indication or method for which it does not seek approval. Three examples of drug molecules namely Aclidinium bromide, Olodaterol hydrochloride and Ciclesonide have been chosen to illustrate precisely how there is “no evergreening” by the orange book listed patents with regard to these drugs. 6750226 Almirall Prodes Farma, SA Active ingredient Sept 5, 2020 The Generic Producers are free to use the active and the composition after their respective patent expiry dates. Innovations by generics can be by way of diverse non-infringing compositions provided the FDA requirements are met. Like Sofotec, other producers may innovate non-infringing improvements to inhaler devices provided they satisfy the FDA requirements to get into the US market. These device patents do not extend the protection term of the active after Sept 5, 2020. “There is no evergreening” of the drug molecule or the formulation claimed in the patents. Here is an example how the patent system promotes innovation and businesses in the market place. 8371292 Nycomed GMBH Method for treating a respiratory disease in a child by administering defined dosages. Feb 1, 2028 The claims of this patent are very narrow and do not in any manner stop or restrict third parties to use any other method of treatment using the active ingredient after the term of the patent covering the active ingredient, formulation and the devices. The table illustrates with examples how the patent system promotes innovation and businesses in the marketplace without restricting the players who are prepared to indulge in innovations and non-infringing business practices. There is no “ever-greening” and /or extended patent protection in one form or another form. In conclusion, patents are “Never-Greened”. This conclusion is also borne out by the fact that table 1 in the article by Beall et. al, six products related to albuterol are associated with numerous competitors such as Teva, Merck, Glaxo, Boehringer Ingelheim and Mylan. For the products having multiple competitors, the basic composition of matter patents usually have expired, leaving claims of narrow formulations and device patents still in force that can be easily be designed around as has been done by various companies. Further, there are also albuterol sulfate inhalation solutions or products approved for Bausch and Lomb, Hi Tech Pharma, Landela Pharm., Nephron, Ritedose Corp., Watson Labs, Amneal Pharms., G and W Labs, Vintage, Vistapharm, Dava Pharms, Mutual Pharm., Cipla, Oak Pharms, and Sunovion. Most of these other competitors have no, or very few remaining, unexpired patents for their products. In this type of situation, substantial price competition among the competitors can and generally does occur, thereby affording little commercial value in relation to the last to expire device patents associated with the products listed in table 1 and avoiding any restrictions on patient access to the active ingredient as the title of the article implies. Prabuddha Ganguli is MHRD IPR Chair Professor, Tezpur University, Assam, India, CEO, VISION-IPR, India. "Can Patents Ever Be “Ever-Greened”? The Answer…They Are “Never-Greened”" by Intellectual Property Watch is licensed under a Creative Commons Attribution-NonCommercial-ShareAlike 4.0 International License. 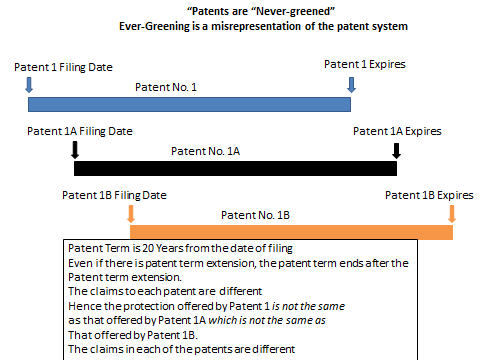 “Ever-greening” of patents is a useful meme to discredit the intellectual property system. That – as Professor Ganguli demonstrates – it has only the most tenuous connection with reality will (unfortunately) do little to stop it flourishing. Dr.Ganguly should be given credit for clearing doubts on a much abused phrase “Evergreening of patents”.Everyone uses this phrase from activists to NGOs ,press to politicicians -without really understanding the fact and the real truth.Under patent law there is no scope for ‘evergreening.of patents ‘ as the life of the patents are fixed and predetermined as Dr.Ganguly pointed out in his article.Of course ,one can definitely question the frivolous patents and obvious derivatives.But then it is the duty of the Patent Authorites who grant the patents to weed out undeserving patents-provided they do not meet the patenting criteria.Why blame the inventors or the companies who are within their legal rights to appy for patents for inventions they beleive worth patenting. Congrats,at least some one thought of going against the (popular) wind ! A well written piece – highly motivated and misguided though! Looks like you have stuck to the side you have chosen so long ago even though you are now a professor. Just presenting one side of the coin is as much a partial guided approach as clearly advocating a stance. Evergreening of patents is indeed a problem and you know it well. The response written by Mr. Gasper quite evidently points out the advertent inaccuracies/misrepresentations in the above article. If you are true to your profession, I am sure you will present the other not so rosy picture about evergreening on this wonderful platform. In order for generics to be interchangeable with a brand name product, they must have an identical route of delivery. Since the patents on the delivery devices generally expire later than other kinds of patents, our study (the beall et al study discussed above and here http://rdcu.be/Go7c) demonstrated that there is often a period in which device patents alone are blocking generic entry. These patents can be challenged, of course, but that takes time and resources (the law provides 30 months to resolve paragraph IV challenges of all Orange Book-listed patents, regardless of their merit, before the FDA can approve a generic equivalent). In the meantime, companies are free to create and patent their own unique device to deliver the same active ingredient and apply for marketing approval with additional evidence of safety and efficacy, but this is different from direct generic competition between interchangeable products and will not realize the same price reductions. Dr. Ganguli’s article above overlooks these critical regulatory and legal barriers that are at the heart of the matter.